International Customers can purchase our special Gift Certificates for friends and family. Why not give them a gift certificate for their birthday, anniversary, Valentine’s Day or Christmas. Let them choose exactly what they want from our wide range of gifts and merchandise. Your friends and family can easily redeem their gift certificates, whether they live in Ghana or elsewhere in the world. Shopadollar gift certicates expire after 3 months of purchase, unless otherwise stated. 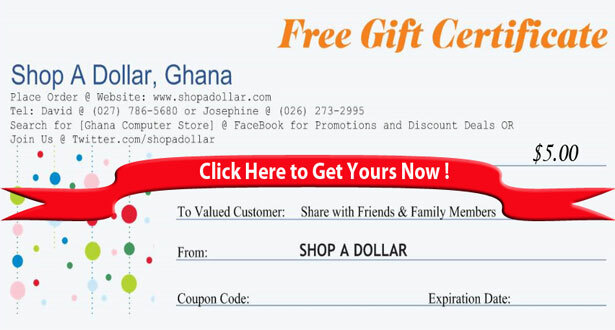 Shopadollar gift certificates can be used to purchase computing and other electronic products from Shop A Dollar Ghana, Africa.